"He's not my boyfriend, he's my husband." The DVD Review and Extras Review are by Rich Rosell. It's sort of strange that oddball hipster Tim Burton goes back to similar stomping grounds with the stop-motion animation of Corpse Bride, a film that seems at first glance like an extension of The Nightmare Before Christmas. In fairness, Nightmare was actually directed by Henry Selick, though it is casually considered a Burton film at heart, incorrectly or not. The whole process of stop-motion almost seems archaic as a methodology, which makes watching a film like this all the more amazing to look at. The time consuming mechanics of the way this one was put together may seem to be much the same as Nightmare. But this is a much different film in tone, a little less dark, though filled with more than its fair of walking, talking skeletons. Set in a gloomy 19th-century European village, Burton go-to guy Johnny Depp voices Victor Van Dort, a slightly trod upon young man who is all but forced to take part in an arranged marriage to Victoria Everglot, voiced by Emily Watson. It seems Victoria's parents (voiced with oily wickedness by Joanna Lumley and Albert Finney) are selfish oafs who have a major cashflow problem, and are looking to marry their daughter into money for their own greedy reasons, even to a "new money" family of fishmongers like the Van Dorts. But poor Victor is a bit of a milquetoast, and when he scurries off to the local cemetery to desperately practice his vows, he inadvertently places the wedding ring on the skeletal finger of the titular character (voiced by another Burton vet, Helena Bonham Carter), Emily, mistakenly thinking it's only a twig. When his new bride rises literally out of the ground, Victor has to deal with not just life above ground, but below as well. And it's the below ground world where the film bursts forth with color, the intentional opposite to the icy blues and deep shadow of the unpleasantly gloomy world of the living. They might be skeletons, but they're really just what inevitably becomes of us all, and they seem to have adjusted to it just fine. In fact, it looks like a lot of fun. This isn't a particularly long film, clocking in at just over 70 minutes, though the plot works this time efficiently, and the story of Victor's accidental marriage is very, very lean. The stop-motion animation is exceptionally fluid and mesmerizing, from secondary characters on through the leads. Danny Elfman, as some sort of skeletal troubadour, croons a key song that fills in a lot of background in short order, and the screenplay from another frequent Burton collaborator, John August (Charlie and the Chocolate Factory, Big Fish), and Pamela Pettler keeps the momentum moving forward at a quick clip. One of the things I was most pleased about was how the character of Victoria�Victor's spurned human bride�is not painted as a shrill harpie or bloated she-beast. Those hackneyed tricks (often seen in a number of live-action features) would have made Victor's dilemma much less emotionally threatening, and instead Victoria is seen as a quiet, gentle sort, much like Victor. Neat little details�such as the piano with the Harryhausen nameplate in homage to the king of stop-motion�are subtle and smart, far from being simple, broad strokes of "aren't we clever?" smarminess. It's clear that Burton and his team must, on some deep level have some genuine attachment to this painstaking art form. Nightmare did much to reawaken this old school methodology, and while I still prefer that film's music and innocently menacing characters, Corpse Bride represents one of the benchmarks of the technical process. And considering the subject matter, it tells a rather sweet story, as well. 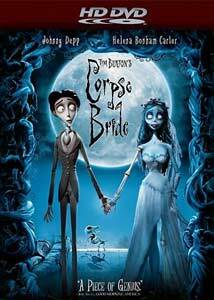 Image Transfer Review: Corpse Bride is in a word, gorgeous in HD DVD. In the land of the dead, the colors are preternaturally vivid, while in the bleak land of the living the limited palette of greys and browns are beautifully differentiated. Perhaps the most astonishing aspect is the ultracrisp level of texture and detail, particularly the amazing detail in Emily's dress. Colors are subtly graded, and there's no hint of posterization, even when pausing the picture and zooming it for close inspection. The only drawback I observed was a bit of edge enhancement haloing on a curtain as Emily and Victor enter Elder Gutknecht's lair. That's a trivial issue in an overwhelmingly beautiful rendition. I don't believe this film looked this good in the theater. Audio Transfer Review: The DD+ 5.1 audio has plenty of directionality and presence; the strings have an excellent warmth, as do the choir of oohs. Vocals are crisp and clean throughout. Noise and hiss, appropriately, are practically nonexistent. The songs have plenty of surround effects and are irresistible on both the main track and the isolated score. Bass levels have plenty of authority without being overpowering of getting in the way of the melody. Extras Review: There's no Tim Burton commentary track here�regrettably not a major loss based on his past attempts�and instead there are 7 brief behind-the-scenes featurettes, each covering a separate element of the production. Inside the Two Worlds (04m:03s) discusses the obvious differences between the land of the living and the land of the dead, while Danny Elfman Interprets the Two Worlds (04m:56s) has the composer offering his creative slant and process on the musical components. Things dip briefly into the production process with The Animators: The Breath of Life (06m:38s), which should really have been much longer, and looks at the delicate work of the stop-motion animators. Tim Burton: Dark vs. Light (03m:39s) is more of a gladhand EPK piece centering on the director, and Voices from the Underworld (05m:58s) looks at casting the voice talent. Making Puppets Tick (06m:33s) is another peek at the painstaking animation process, and that leads into The Voices Behind the Voice (07m:35s) that uses split screen to show the voice talent recording their dialogue while the animated segment plays alongside. Not necessarily a making-of, but fascinating in its own right is The Corpse Bride: Pre-Production Galleries (13m:27s) segment, a narration-free piece set to Elfman's original score showing test footage of the various characters and their stop-motion mechanics at work. A nice plus is the availability of a music-only track, offering the option to play the film with only Danny Elfman's score, presented in Dolby Digital+ 5.1 surround. Personally I'd love to see more DVDs with a separate score audio track, especially one as fun as Elfman's. The disc is cut into 24 chapters, and features optional subtitles in English, French or Spanish. Tim Burton returns to the realm of stop-motion animation for another go round where the dead seem like more fun than the living. The handful of songs aren't quite as good as in The Nightmare Before Christmas, but the humor is dark, Danny Elfman's score is no less bubbly and high-spirited, and the whole experience is fun from start to finish. The stellar audio and video transfers only seal the deal on this one. Highly recommended.